Revisit: To comment or not to comment, that is the question . . . I trust that you will find humor in the analysis. My intent was to entertain, hence such descriptions as fingers worn to the bone, nails bitten too short for nose picking, a threat to include naughty images in my posting, etc. I also trust that you will detect self-deprecation and pathos in the thoughts I expressed in the original posting. No, I do not suffer from low self-esteem, nor am I depressed, and my appeal to pathos was an attempt to get viewers to respond emotionally and identify—just to identify, not to agree with—my point of view and perhaps to feel what I feel when I write. Very soon after I published the analysis I received two comments that warrant a separate posting. Both are cogent, very convincing and relevant and obviously heartfelt. Both comments deserve wider and better exposure than being hidden in the shadows of the world of comments, and I believe others will appreciate reading them. That is the purpose of this posting—to make the comments available to a wider audience. This is his comment, posted as received. You’ve reminded me of a recent meeting with a church building committee. The purpose of the meeting was to interview building contractors and to try and make a decision about which of three contractors would be chosen to build the new church building. One of the three building contractors had submitted a lower price than the other two, but there was still some doubt in the committee member’s minds about whom to select. That doubt was the reason for the meeting. After the contractors had left the meeting, the committee discussed their feelings about how the interviews went and, generally, how they felt about the contractor’s responses to questions and comments made by various committee members. One of the committee members made the observation that a couple of the contractors didn’t seem very interested in what they had to say. When asked why he felt that, he responded by saying that he, at one time, was an insurance salesman and that he always looked for some kind of response from prospective clients when he did his sales pitch. “At least a nod,” he said. At least that let him know that they were listening. I’ve enjoyed, in one way or the other, all of your postings. Happy. Sad. Contemplative. They’ve evoked a wide range of emotions. I haven’t commented often, but if you could see me, you would know that I am nodding. I’ll try to do better. This is her comment, posted as received. I don’t really know how to comment on this without it sounding like a criticism, Mike—and I really don’t want to upset you. So—I hope you’ll just regard this as my personal thoughts (which is all they can be anyway). Personally speaking, you lost me a little way back. Reasons? A few. One is that you keep reposting old posts in the hope (as I understand it) that the reposting will garner comments where the original posting didn’t. The thing about the blogging world is that it thrives on freshness—readers rarely enjoy seeing the same old stuff, they just move on to pastures new. A lot of your posts are ones that were not posted all that far back and anyway, there is an archive here if people want to see what you’ve posted before. There are a lot of reasons people don’t comment on a post, some of it to do with the content, some to do with that person’s mood at the time of reading it. Some people intend to post a comment and then get distracted. Some leave it so that they can think about what to say and then decide that they can’t put into words what they want to express, or decide that they don’t really know what they think about the content anyway. Some don’t feel sufficiently tuned in to the blog author’s train of thought or way of saying what they’ve written. You mention the number of people who have come to your blog compared to the number who have commented. 27 visits per posting…and few comments? That’s either not enough people visiting to make many comments. The reason being that this world is made up of more people who follow than people who lead, and the ones who comment tend to be those who lead and not those who like to be led. You need to attract the right sort of people, in other words the sort of people who are like yourself, possibly with a similar type of history or background or perhaps coming from a similar philosophical or political background. Does that make sense? It’s fine to have people who disagree with you, but only if you find something to agree on too and I get the impression from reading a lot of your posts that you feel more comfortable with people who don’t provoke you too much (or at all!) And how to do that? How to find those people? Only by spending time finding them, via their own blogs. Find blogs that you like yourself, find bloggers with whom you have something in common, whatever that is—whatever is important to you. It’s a strange world, the world of blogging, in many ways it’s not like ‘real life’, and in many ways it’s exactly like it—but it takes a lot of effort. Another reason for my absence is that I feel your blog is mostly for your family, it’s full of reminiscences, which is nice, but I feel a lot of the time that I’m just intruding on someone else’s life rather than being included in any of it. A family blog is fine, but then you need to draw in your family to read it and, as I don’t personally know your family, I can offer no advice as to how you could do that. I’m not sure if you know this, but there are settings in WordPress in which, should you want, you could invite certain readers in, give them a password, and let only those people read your posts. Perhaps this might be something to consider, if you are mostly writing a memoir (which is what it seems to be). On the other hand, as your blog is (mostly) searchable via Google, you’ve obviously opened it out to be search engine friendly—so I’m rather confused about the intent of the blog! The main reason, though that I’ve been absent, is our politics and viewpoints about things are very different and I feel quite alienated at times by the content of some of your posts. I’m not, by nature, a confrontational sort of person so I don’t comment on things that I strongly disagree with. I prefer, usually, to remain silent. However, that said—why am I responding to this post? Because I think it would be a shame if you were to stop writing your blog. You do need to attract more people to read it, and yes, you do need more comments from people, but I do understand how upsetting it can be to have no response. I hope things improve for you, I really do. Cohan, A Declaration of Independence and a wild coaster ride . . . I began this posting as a comment to a blog posting by another Word Press writer, one that promises—and delivers—a funny every day, but somewhere along the way my comment took on a different character, that of a new posting on my blog. I believe that any visitor to that funny every day blog will be entertained and enlightened. When you have finished my posting, you’ll find a link at the end for the funny every day blogger. I believe you’ll enjoy both. 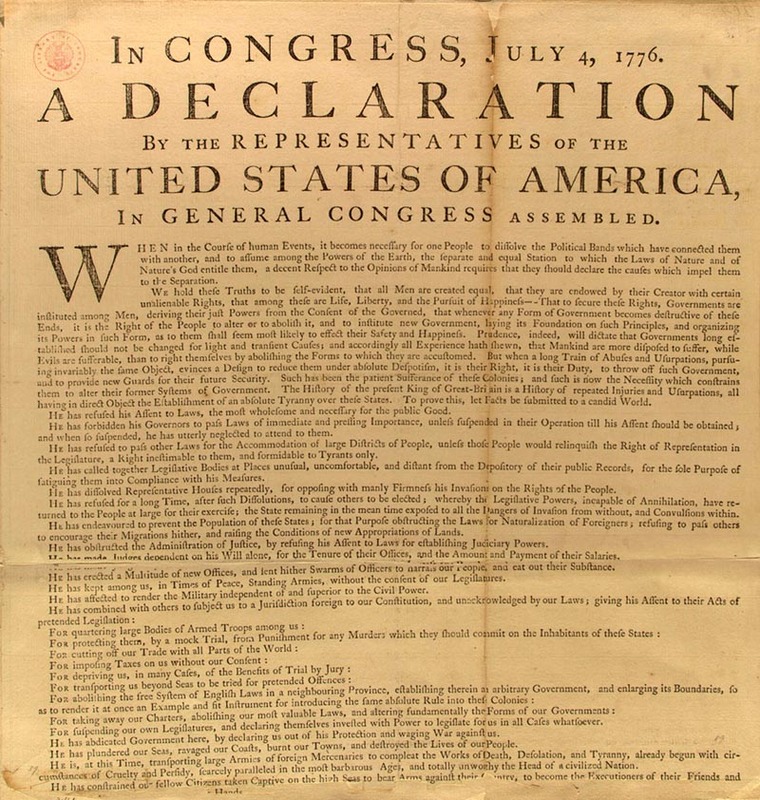 The funny ever day posting is a blistering examination and a repudiation, more or less, of everything intended by one of our founding fathers—Thomas Jefferson, the well meaning—perhaps—author of A DECLARATION by the REPRESENTATIVES of the UNITED STATES OF AMERICA, in GENERAL CONGRESS Assembled—our Declaration of Independence dated July 4, 1776. The posting is hilarious from start to finish, a classic work that deserves to be housed with the original document at the National Archives or perhaps with Jefferson’s original draft housed at the Library of Congress—both are repositories located in Washington, DC, that sinkhole on the east coast surrounded by the states of Virginia and Maryland. I tender my abject apologies to James M. Cohan for my corruption of his classic song, You’re a grand old flag, but I have retained the lyrical cadence of his original work. Note that I have replaced flag with the word document, referring to the Declaration of Independence but shortened to doc for artistic rhythm and poetical purposes. Also please note that the phrase for me and for you is not specific to, nor is it directed at, any particular person, gender, age group, profession, political party, sexual preference, nationality, race, ethnicity or religion or to any specific school of thought except for two exceptions and those are purely accidental—I refer to the terms Dems and Repubs, terms that may or may not be specific in nature, a matter left for readers to define for themselves. And rebuts from the Repubs that fave. And is upheld by only a few. Poppycock—anglicized form of the Dutch pappekak, which literally means soft dung or diarrhea, an interjection meaning nonsense or balderdash. I believe that any visitor to this blog will be entertained and enlightened—click here for a wild ride that outclasses, in every way, every rollercoaster ride on the planet!